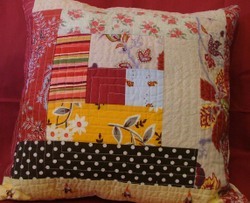 Since I spent all last week selfishly sewing for myself I spent a little time sewing a couple of gifts. For some reason I feel more stress about sewing a gift than any other sewing I do. When someone buys something you've made it is because they have a need for that item, be it for themselves or to give as a gift, they chose the item. When you give something you've made as a gift you are essentially saying "I thought you might like to have this." Quite a leap of faith in some cases. Not everyone appreciates handmade gifts. Though I may be quite taken with all things patchwork at the moment I know not everyone shares in my excitement for randomly pieced scraps of fabric. And just because I think this group of unrelated fabrics works together I can't be sure the recipient will. 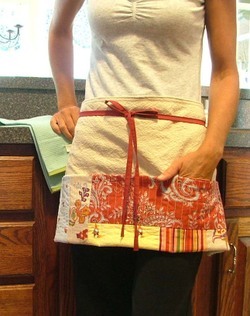 Aside from those little worries, I really enjoyed making this apron, another project from the Machine Made Patchworks book. I made an apron for this person because she likes to cook, though now that it's finished I think it may be more of a craft apron because it has pockets all across the front. 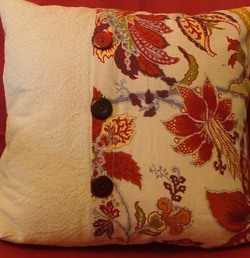 I also made this pillow... just because I like to make pillows. If I don't talk myself out of it they will be on their way to my friend tomorrow. Thank you to the sweet, talented, and a little crazy (in the most lovable way) Tanya for designing my new banner. Transplant Story: Things are looking so much brighter! I'm the dummy those computers for dummies book are written for.